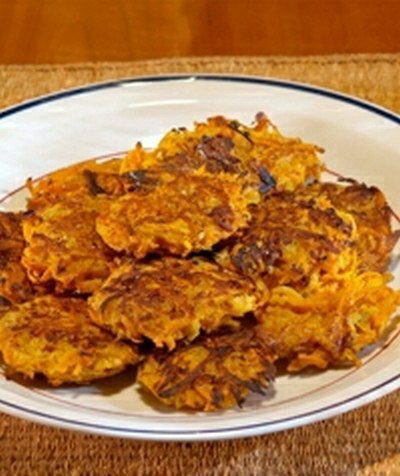 Sweet potato and pear latkes? Yep, this recipe contributed by the AICR is a great alternative to classic potato pancakes or latkes. Loaded with fiber, and phytochemicals and low fat to boot! And the sweet potato and pears make an excellent flavor combination that will have you thinking of all kinds of reasons to make and serve these delicious potato cakes. Enjoy! Preheat oven to 450 degrees and place two nonstick baking sheets in the oven. Peel the potatoes; peel and core the pears. Grate each using a food processor. Strain any excess liquid. Grate the onion. Set aside. In a large bowl, beat the egg whites, bread crumbs, cinnamon, salt and pepper. Stir in the potatoes, pear and onion. Mix until coated. Remove the hot baking sheets from the oven and spray thoroughly with canola spray. Spoon latke mixture onto sheets, forming 2-inch patties. Bake until golden brown, about 12-15 minutes per side, turning once with a spatula. Serve with fat–free sour cream and/or warm applesauce, plus a sprinkle of dried cranberries on top of each serving, if desired. Makes 8 servings, 3 latkes each. Per serving: 180 calories, <1 g total fat (0 g saturated fat), 39 g carbohydrate, 5 g protein, 5 g dietary fiber, 210 mg sodium.